"The Must Have Motivational Quotes Book". This motivational quotes book is not just a collection of the same quotes, from the same famous people, that you see in every other book. All 101 motivational quotes in this book are unique and original. 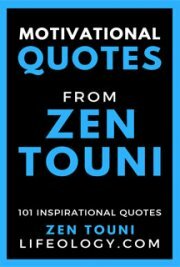 All 101 quotes were passionately written by the author, Zen Touni. The quotes are short, clever, and packed with motivation and wisdom. "Powerful Inspirational Quotes" . The inspirational quotes featured in this book, cover topics such as life, success, happiness and love. Hopefully, you will find at least 1 quote that will resonate well with you. Ideally you will find many more. "Social Media Friendly". You are welcome to post the quotes on Facebook, Instagram, Twitter, and Pinterest. Just make sure to credit Zen Touni after the quote.